Last week I was traveling in the Boston area and for lunch one day was lucky enough to stumble upon a wonderful little bakery and cafe called Concord Teacakes. They served a “Healthy Edamame Salad” that was so good I had to try to recreate it when I got home. It is delicious and good for you! There has also been some controversy over the health benefits of soy, but like anything–moderation is key. 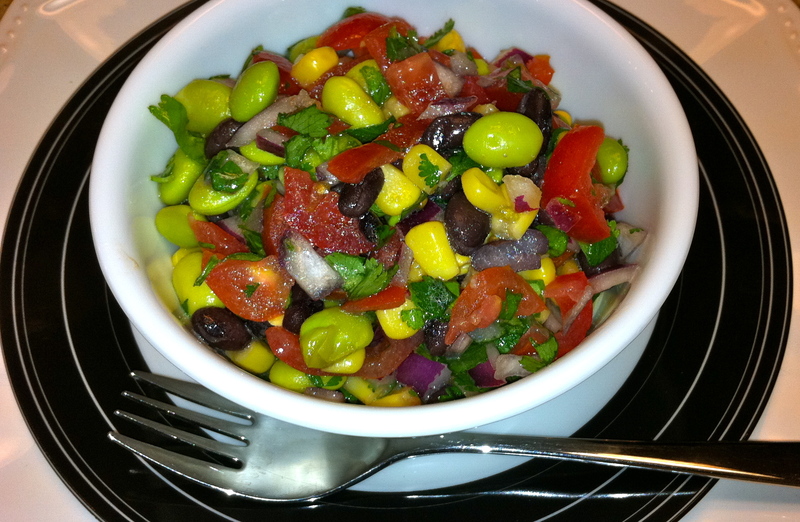 Begin by placing all salad ingredients together in a bowl. Begin preparation of salad dressing with fresh squeezed lime. If you don’t have one of these great lime juicers they are very handy. They allow you to get all the juice out of the lime with very little effort, and literally turn the lime inside out! Combine all salad dressing ingredients together in a measuring cup or small container. Whisk the combined ingredients and mix in with salad. Serve and enjoy! Serves approx. 4.